This week, I learned how to make a 1-part mold. This type of mold is usually used to make creamers or other functional wares. Because this is an objects class and I am not making functional wares, I will be casting from my hand-sculpted object and make three unique, iterated objects from those casts. How exciting! When pouring the plaster, this clay will form the space that will make the mould. 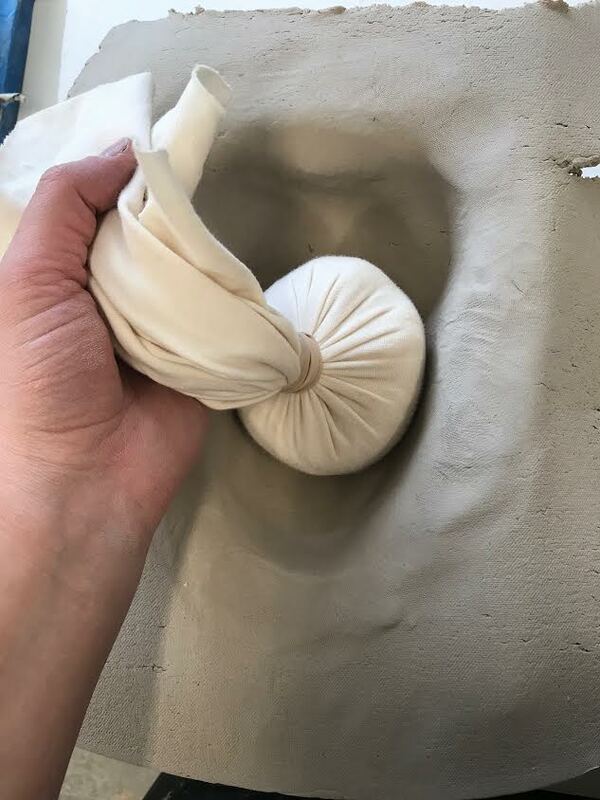 I have already experienced how to mix plaster when pouring the tile molds for our first assignment, I know to coat the clay with mold soap so it will not stick to the plaster, and how to pour the plaster and then tap the mold against the table so it loses any extraneous bubbles. These cottle boards are a more sturdy process than what we used when making the tile molds (tar paper)—and let me tell you, cottle boards make moldmaking feel much more official. Below is the result: plaster setting and forming for just about 45 mins within its sweet container of cottle boards, to a firmer surface that can be engraved and then pulled from the cottle as it is fully set. After checking that the plaster is cool and firm, I remove the cottle boards and layer of clay to reveal the plaster mold. I now have to do the work of refining the mold while it is still damp (from the water it has absorbed). Look at all the COOL TOOLS you get to use when refining a plaster mold!!! This is the most diverse rasp collection I’ve ever seen and that’s because you want to be able to form your plaster with finesse and precisely fine-tune its surface. 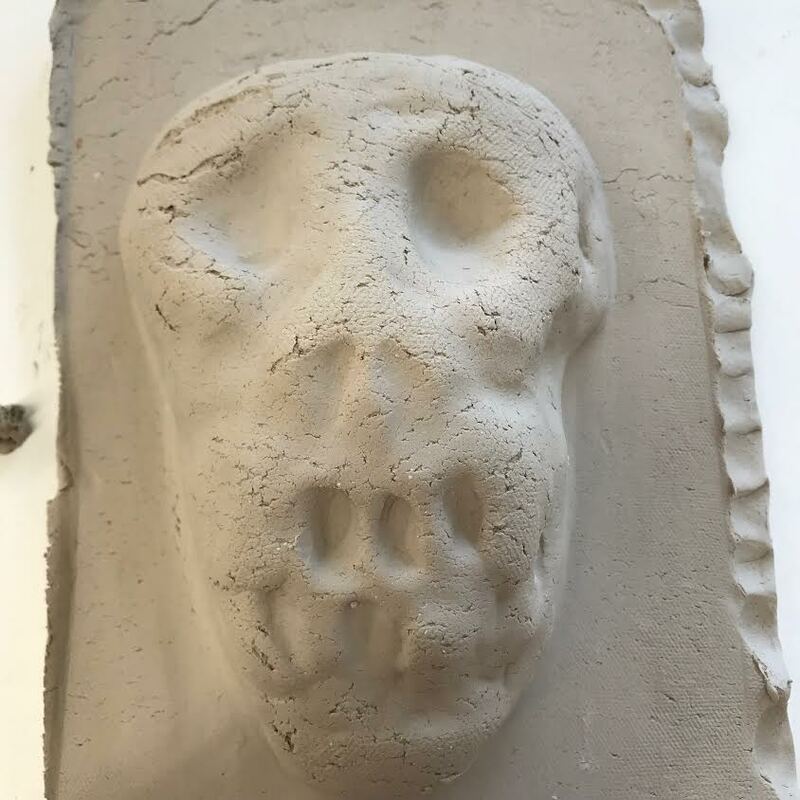 I obviously need some more smoothing to take out the uneven areas from the edges of the mold, like near the top of the skull to avoid difficulty when pressing clay and removing it from this mold. Here, you can see some of the edges are more smooth, and I will continue to smooth them until there is no undercut, no overhang and close to no imperfections in the mold’s surface that could be picked up by clay, in the form. I continue to rough out the mold until I run my fingers along its surface and have decided its contours and inside are smooth enough to try a press. I am using the porcelain available to our studio, pressed into a 1/2” slab which can then be pressed into the mold. A pouncer is used to tap the slab into the mold, making a more even surface than if I were to use my pokey little fingers. This is the way that real professionals make a cast from a slump mold: THEY POUNCE IT OUT. You can see I have achieved a depth of about 2-3 inches through pouncing, and the surface is generally even. This is the depth of this mold and the pouncing technique has resulted in an even thickness across the slump. Time to turn it over and hopefully the cast will pop out with no difficulty! My mold has produced one skeleton monkey face! It has some superficial parting in the clay, which I believe has to do with that the plaster is still drawing wetness out of the clay body, and because I may have worked the porcelain to a too-dry point in the slab-roller or with my hands, when I prepared it to be put in the mold. These superficial cracks can be easily smoothed and the internal structure of the cast is quite secure, I just need to let this one dry to a bit more solid so that I won’t poke my fingers through its clay as I make smoothing motions with a clay tool, or sponge. I will make multiple other casts to be used and manipulated into three, complete different objects—one of which I plan to glaze with a metallic luster for an extra pirate-y effect. I would say this mold is a success—All hail Skull-y Head!!! Onto the next post, which will share these continued objects…and some more on the prelude to my in situ casting processes. Thanks for tuning in!